A rather old style for tomobako with front sliding cover Tomobako made for a vase made by Yasokichi 3rd. The word ’tomobako’ refers to the wooden box (it could, rarely, be lacquer) that often accompanies a porcelain piece made in Japan. 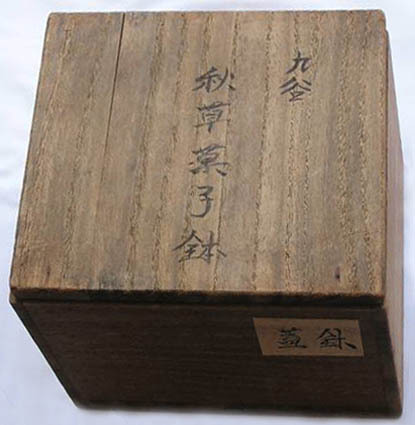 This wooden box is made from the Paulownia tree. Paulownia wood has been used in Japan hundreds of years and is said to consist of 75% of all the logs imported. 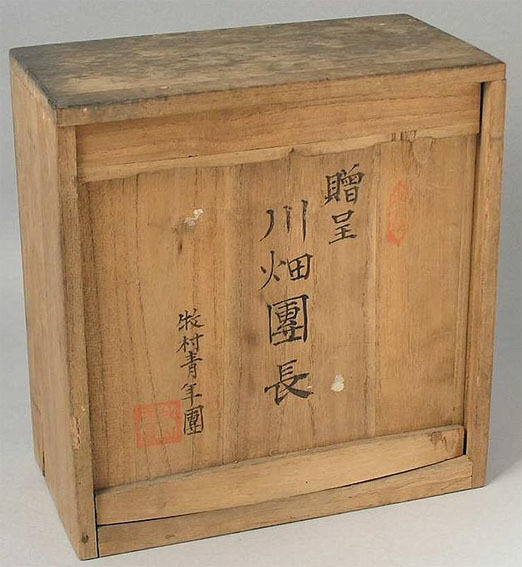 Wooden chests of drawers called Tansu are made from this wood and nearly every Japanese home has a Tansu of solid Paulownia, or sliced Paulownia veneer. The wood is 30% lighter than any comparable American hardwood, falling mid-way between Balsa wood and poplar, being 15 to 19 pounds per cubic foot air dried. Sources I have read indicate that this tree will not rot when felled in the forest unless it is touching a contaminant of some sort, and logs completely debarked and 2 or 3 years old are exported for use. The lumber can be air dried in 30 to 60 days in racks or kiln dried to 10% - 12% moisture in 24 to 48 hours which is pretty amazing. 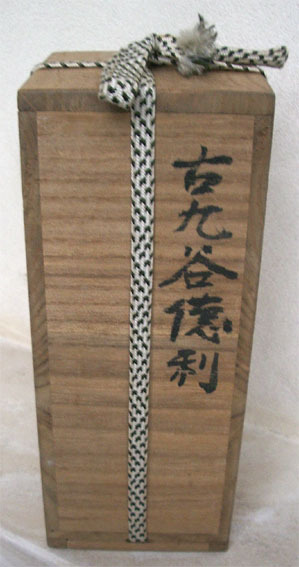 Other uses of the wood are musical instruments called Koto, wooden clogs called Geta and large and small gift boxes. 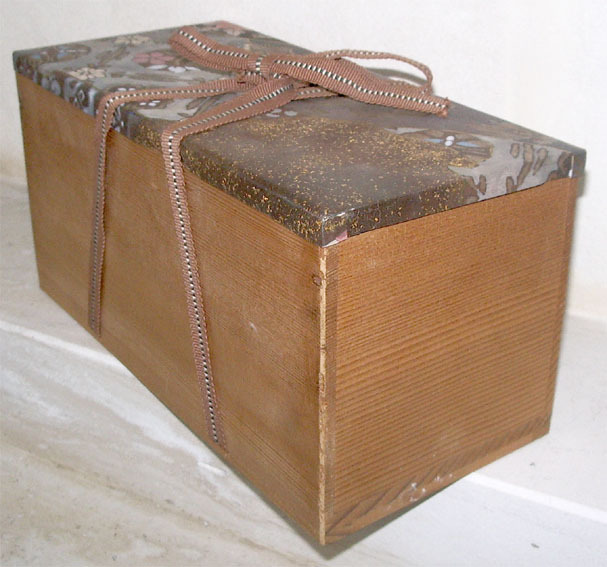 These gift boxes are what are referred to as ’tomobako’. 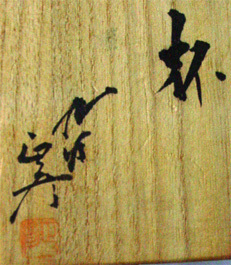 While the Japanese do not consider this tree sacred, the wood is held in reverence by those who work with the tree, possibly due to the ability of the tree to regenerate from its own root. This, coupled with its resistance to rot and its freedom from checking and cracking, may account for this reverence. So, one can see the tomobako is made from a special kind of tree. Most pieces purchased today that have an accompanying box is a simple tomobako. By simple, I mean plain looking, and a lid that does not fit snugly, and has no recessed slots to contain a kind of cloth wrapping ribbon called Kumihimo. 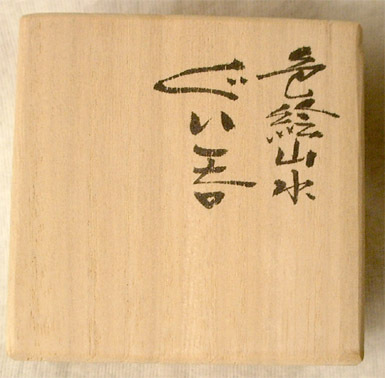 It may or may not have calligraphy on it, and sometimes it is stamped as opposed to being hand written. 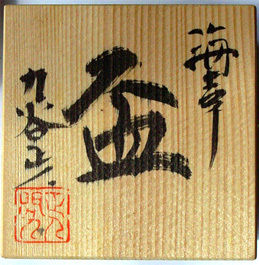 On a simple tomobako, there may be a simple explanation of what is inside like "Guinomi" - a sa’ke cup, and maybe a designation like "Kutani" and a stamped red seal (usually shop or distributer’s marking). Sometimes a small printed paper that gives more information, in general, but not specific to the sa’ke cup, and no artist or kiln information. No nails are used and with simple tomobako, they are glued together. Rarely is there any marking inside the box. In buying a piece second hand, sometimes a tomobako made for another piece, long separated from its original piece, will be use, and both size and written description will not match. This is not so common, but it does happen. Old tomobako always have a textile ribbon which needs quite a pratice to tie up. 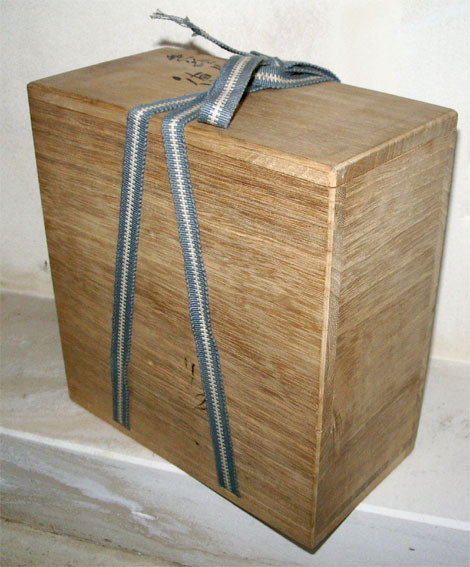 These boxes with ribbon are a step up from the simple tomobako, These box lids often contain wooden ’rails’ inside the lid to ensure a snug fit, almost air tight. Wooden nails are used with and without glue, and many are made by hand. Today there are tomobako craftsmen who will make a custom box for a special piece that somehow got separated from its original one. The better ones have four ’rails’ to ensure a tight fit and have incredibly mitered corners. Older boxes show a kind of ’patina’ of use as oily fingers, dirt and dust from storage, and an occasional termite attempt gives them personality, and they start to darken a bit. For exceptional pieces and for many artist pieces actually made by them, the tomobako is made just for that piece, a limited edition of just one. 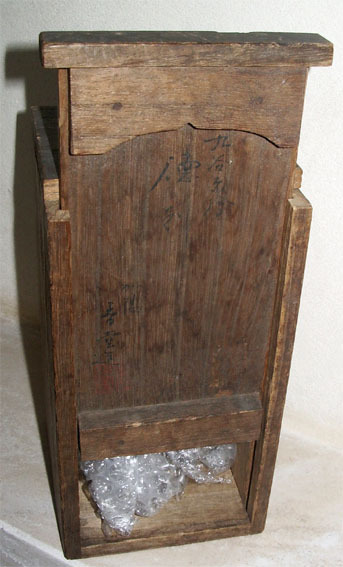 Although Paulownia is the standard, sometimes a more exotic wood or a lacquered box is made. There can be brocade cushioning at the bottom, and in each corner. 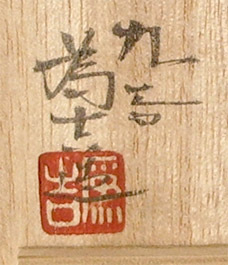 At the top of each corner, gold lacquer calligraphy can be found, and sometimes the piece, one of one, is given a name, rather than a general description. I looked at a piece earlier this year, a relatively small guinomi or sa’ke cup. Value estimated at 15 million yen. Box within a box described as above, wrapped in yellow/orange cloth with artist’s seal, and exquisite silk textured tie ribbon. We often use gloves in handling these boxes and the piece inside. 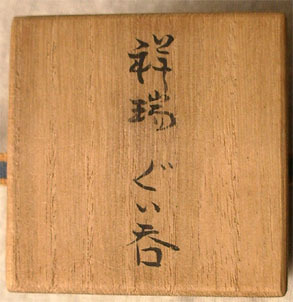 The box pair themselves had an estimate of more than 1 million yen due to their nature and artist connection. So remember never discard them!